The first few days of July saw a huge number of people from different Connected Communities projects decamp to Cardiff for the Connected Communities Festival. This event was the successor to last year’s ‘Showcase’ – you can read about how we got on there in this post – and the change in the name is indicative of the differences between the two events. The Festival was much bigger; instead of being set in a university context, it took place across a range of different sites, with correspondingly varied breakout events. While last year the Showcase lasted only one day and was preceded by an inward-facing networking day, this time the outwardly-facing event lasted two days with a full programme of activity across both – as you can read about in the programme in English and Welsh – as well as at project stands and installations based in the Motorpoint Arena in town and at the St David’s Hotel in Cardiff Bay. Representatives from the Understanding Everyday Participation project did a range of things across the Festival (as well as contributing to the early career researcher workshop that took place on the following day). First off, project Principal Investigator, Andrew Miles, co-organised a workshop with the Cultural Intermediation project on the limits of co-construction. This workshop was recorded, and you can watch it in the frame below. The main UEP contribution was under the banner of ‘Everyday participation and cultural value in DIY music’. Because of the scope of the project, and the plethora of rich and varied data that we’ve currently got from the first three project case studies (as well as UEP’s other work packages), we aimed to put together a fairly self-contained piece of work which was informed by some of the themes that are emerging across the project, and relevant to the place where the festival was happening in the first place. You can see me talking about it in the frame below. We were interested in talking about DIY music at this event for a number of reasons. Music has been at the heart of debates surrounding the relationship between cultural taste and social inequality (for a quick introduction to the academic literature on this see this, this, this, and this); some of the emerging findings from the project research, particularly from the interview data but also from focus groups, has suggested a very strong relationship between music and identity, particularly among younger people; and music is central in debates about the role of the ‘creative economy‘. DIY music is particularly interesting in these contexts as the strict boundaries that are drawn by the language of the creative economy tend to crumble: sharp distinctions between performers and audiences, promoters, collaborators, venue staff, the people running record labels, and so on, just don’t work. At the festival itself, this took three forms. First, we put together a zine consisting of a set of reflections on DIY music, by people who are involved in making DIY music in Bristol and Cardiff. This was coordinated by Ellis from Trust Fund, and the contributors were Henry Ireland, Joff Winterhart, the Joy Collective, Totem Terrors, Mark Daman Thomas, Grace Denton, Ben Trinkle, Roxy Brennan, Deborah Withers, the Jelas, Ashli Todd, and Owen Williams. It was illustrated by Gemma Batten and translated by Cyfiethu Cymunedol. The remaining copies are currently available in Spillers Records in Cardiff, or you can download the PDF here. Second, we conducted a social network analysis of the DIY scene in Bristol and Cardiff. 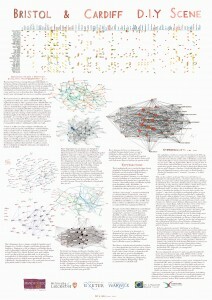 The goal of the SNA was to understand how looking at different kinds of relationships within music scenes influences the kinds of networks that are produced; a network of who’s in bands with whom is different (and more sparse) than a network where you also take into account when people who are in one band have put out records by another, have put on gigs with a third, and so on. This was written up by me and Ellis (who collected the data) and illustrated by Aaron Sewards. You can see the SNA poster we created at the bottom of this post, but in brief the matrix at the top shows different kinds of relationships between people and both bands and artists – being in a band, putting a gig on at a venue, putting out a band’s record, and so on – and the different diagrams report the connections between individuals as we take more of these relationships into account. Presenting work in this format was an interesting exercise. In the context of the Connected Communities Festival, which we might think of as being halfway between a conference and a dissemination event dedicated to the kind of work going on in and around the Arts and Humanities with a focus on co-production, it felt like a fairly natural fit: all the data were collected by our “community partners” (or, to put it another way, the musicians and other key actors in the scene with whom we were working); our role in writing was confined to the more technical bits of the SNA; and no part of the gig could have happened without enthusiastic participation from the bands, promoter, venue, and everyone else who contributed to the atmosphere. While we didn’t have any of these people on the stand during the day at the Festival itself, this is what happens when you have an event that runs between 9 and 4 on weekdays: none of the musicians or anyone else could easily take that much time off work. Certainly the atmosphere at the events – even at the two main venues of the Festival – felt very different. I was apprehensive about the mix between a group of academics relocating to a gig on the evening of the second day of workshops, and a group of people who’d have gone to that kind of gig anyway, but it ended up feeling fairly natural: it’s not as if nobody who works on a Connected Communities project had ever been to a gig before, and the zine and poster attracted a lot of interest from the audience (many of whom were finding themselves and their friends in the SNA plots). Hannah Bayfield, who was another attender of the event in her twin capacities as early career researcher and active member of the Cardiff DIY scene, has written a piece about her reception of the gig, and about DIY more generally, here. All in, the Connected Communities Festival gave us the space to develop a self-contained piece of work which is relevant to a lot of the themes that are coming out of the UEP project, while being directly relevant to the context in which the event took place (and giving me the space to put a gig on as a part of my job, which isn’t something I ever expected to happen). The research that has come out of the Festival is looking promising, and the reception that we’ve had for the work that we’ve done has been really positive. This entry was posted in General News by Mark Taylor. Bookmark the permalink.